The Junior League of Raleigh, a nonprofit organization focused on training women as community leaders and volunteers, is partnering with Belk, for the 3rd annual Fashion Forward event. The annual spring fashion benefit will celebrate the season’s must-have trends at Belk Crabtree Valley Mall. All event proceeds go to the Junior League of Raleigh to support its community partnerships, volunteer service and leadership training. 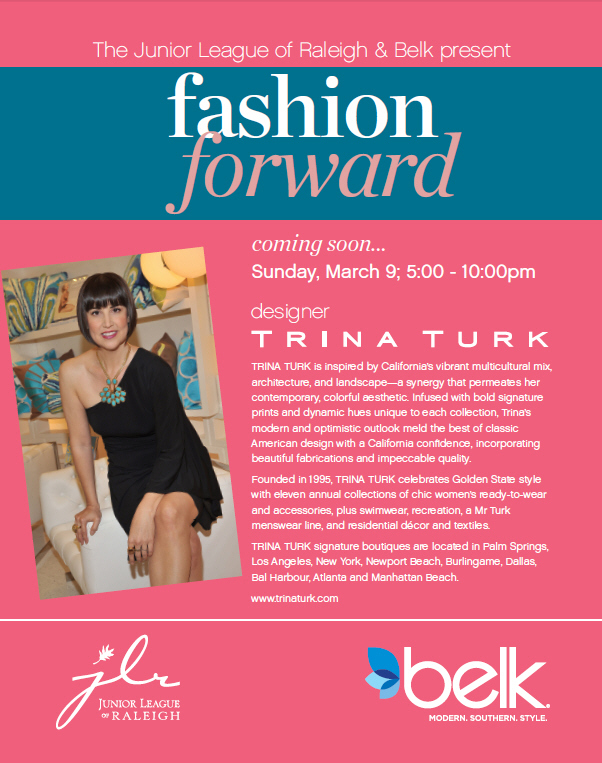 The event will feature a runway fashion show at 7 p.m., presenting all the latest spring fashions from Belk. Guests will enjoy hors d’oeuvres and beverages while shopping before and after the fashion show. There will also be a special guest appearance by renowned fashion designer Trina Turk. General admission tickets are $25 each and include food, drink and a Belk gift card. VIP tickets are $75 each and include food and drink, a pre-event reception, a VIP gift bag, a Belk gift card, fashion show priority seating and one Diamonds & Champagne Raffle ticket. All ticket holders will receive a 20 percent discount* on their regular and sale-priced purchases during event hours, with very limited exclusions (*15 percent discount on shoes and housewares). Tickets are available to the public and may be purchased on the League’s website. LOL! A streak may be the way to go. This is my first time with all over color. I used to mainly do streaks and it was easier. Thanks for stopping by Kimi!